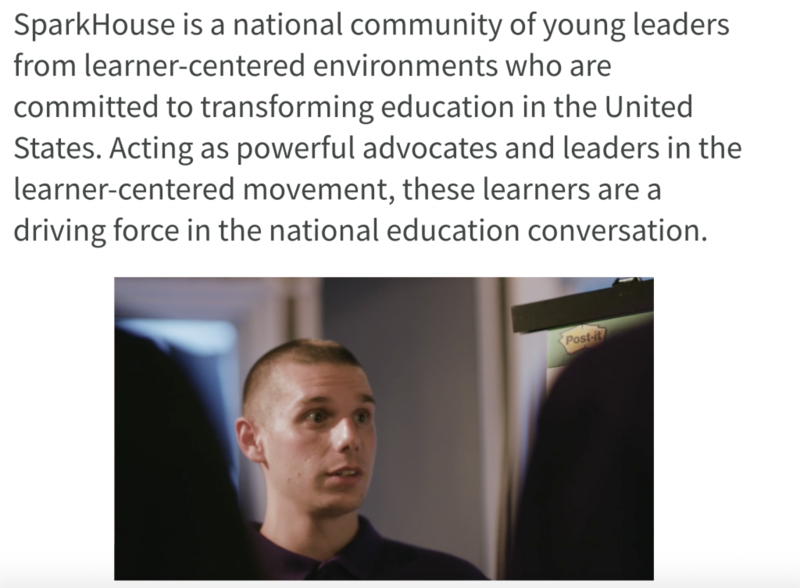 SparkHouse is a national community of young leaders from learner-centered environments who are committed to transforming education in the United States. Acting as powerful advocates and leaders in the learner-centered movement, these learners are a driving force in the national education conversation. We discovered this sense of urgency once again during our second SparkHouse gathering in November 2017. In both instances, every learner immediately began exchanging contact information, discovering the unique strengths everyone brought to the table, and formulating ideas on how to introduce and expand the movement in their communities. They came to the event as leaders of their environments and left as leaders of a movement. Their voices were so powerful that we could do little more than simply have you read about their ideas and excitement yourself. What do you wish to see in this movement? What is the leadership you want to contribute to the movement? What would you want to say to our readers about learner-centered education, learners in general, and/or your experience at SparkHouse? Are you ready for SparkHouse? SparkHouse has become a powerful community within the learner-centered movement that stretches well-beyond the two days we come together in person. Young learners (and their mentors) are able to take the knowledge, skills, and dispositions they collect at the gathering and apply them within the contexts of their local communities and beyond. We’ve heard stories of learners presenting to their local Board of Education, state legislature, district administrators, and mentors. We’ve seen learners create their own national organization to engage even more youth in the learner-centered movement. We’ve watched as young learners command the stage in front of education audiences at major conferences and events across the country. And, we’ve witnessed learners declare they want to become educators themselves, so they can bring learner-centered experiences to the next generation..
All of these stories are just the tip of the iceberg of what’s possible when we engage youth in the conversation about the why, what, and how of transforming education so that every learner can explore, discover, and live into the futures they desire. Interested in learning more about SparkHouse? Send an email to share what excites you about SparkHouse, the role you in play transforming education in your community, and how you’d like to get involved.